Located in the thriving business city of Salt Lake, Dr. Jeff Chung's doctor office specializes in physical rehabilitation and medicine. Dr. Chung graduated from University of Michigan Medical School, and belongs with the Utah Spine & Joint Clinic. His medical field involves methods that greatly improve abilities and qualities of life in patients who suffer from physical disabilities. This includes a wide range of disorders such as brain injuries, strokes, spinal cord trauma, muscle damage, and other medical related issues. People, who need to be diagnosed and treated by doctors like Dr. Chung, have paperwork with records of medical notes that are important. 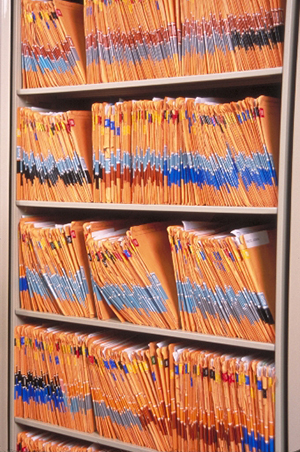 With an increase of files, a shelving system was necessary in order to organize and store documentation for medical patients. Stationary file shelving was provided by NationWide Shelving after the sales team investigated and figured out the necessary requirements for Dr. Chung's office for sizing in width, height, depth, and volume dimensions. The amount of floor space and type of room, where the shelving was needed, was taken into careful consideration when the brand and quality of the storage system was being chosen and decided upon. The Feature: Versatile dividers placed on the surfaces of shelving decks provide better organization. The Advantage: With flexible organization, productivity can be increased by a large amount since it takes less time to find a specific patient file. The Benefit: Medical patients can have their records efficiently stored and be kept up to date with accuracy. This also helps the doctor office grow in business since customers can be visited more quickly, which makes customers more happy and leaves room for more appointment windows. Richardswilcox, also known as Aurora Storage, designs and builds stationary file shelving for applications that include equipment doctor offices. Not only does Richardswilcox stationary file shelving have a purpose in organization and space saving, but the storage systems also are designed with custom look options that are modern and aesthetically pleasing for both doctors and patients. Floor space can be saved up to 50% (fifty percent or more) than other competitive shelving brands. This frees up room for more patient beds, physician consultation rooms, nurses’ stations, or visitor waiting areas.